We want to thank all of the individuals who have given so much to our neighborhood. 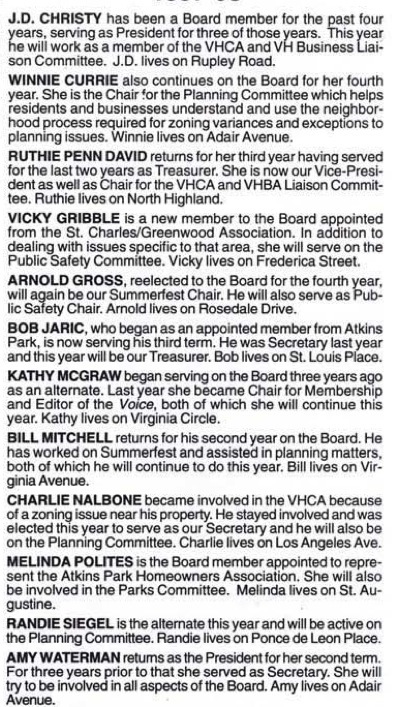 For more than 40 years VaHi residents have been stepping up to serve as directors and to lead committees and projects for the betterment of all. We are still trying to complete this list. If you have information about those who served – especially in those very early years, please pass that information along to the communication committee (communications@vahi.org). Kim Nickels, Vice-President, co-chair Summerfest, liaison to VH Bus. Assn. Mary Chance, Atkins Park rep.
Winnie Currie – NPU rep.
Ed Neal – St. Charles-Greenwood rep.
Tinka Green – Atkins Park rep.
Richard Dobkin – Atkins Park rep.